When organized crime uses a legitimate establishment as a cover for an illegitimate one, that's what's known as a "front." That mobsters would use a front to conceal their illicit activities is only to be expected. After all, they wouldn't stay in business very long if they tacked up signs that said, "Drugs N' Prostitutes R Us." No law enforcement officer worth his donuts would ever accept a front as evidence of the nonexistence of a criminal enterprise. Yet America has repeatedly drawn similar conclusions regarding our enemies' manipulation of dual-use facilities and technology. Today, it's almost unanimously accepted that President Clinton's 1998 bombing of the al-Shifa chemical plant was a mistake. This conclusion is based largely upon the revelation that the Sudanese facility was a legitimate pharmaceutical plant. The possibility that this could be true, while at the same time deadly nerve agents were produced at the same factory, has never been given serious consideration in public debate. This, despite intelligence which found that the plant manager had been in repeated contact with the head of Saddam Hussein's chemical weapons program. What must we suppose they were saying to each other, "Hot enough for ya?" In 2004, The UN Monitoring, Verification and Inspection Committee reported to the Security Council on the missile sites that Saddam had dismantled and moved out of the country in anticipation of the American-led invasion. While showing before and after pictures of one such site, UNMOVIC spokesman Ewan Buchanan explained that it had also contained dual-use equipment, including a reactor vessel, a freeze drier, and fermenters. "You can make all kinds of pharmaceutical and medicinal products with a fermenter," he said. "You can also use it to breed anthrax." If America had drawn the obvious conclusion from this, the "no weapons of mass destruction" fallacy would have never taken hold. Therefore, we must have assumed that these, too, were innocent pharmaceutical plants. Saddam presumably disguised them as military installations so that we wouldn't bomb them, given our recent history of curious animosity toward pill factories. 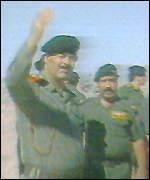 Following Saddam's overthrow, our soldiers found many large drums of chemical agents hidden in the desert. These poisons could have been used to produce either chemical weapons or bug spray -- so naturally, our government officially labeled them as "pesticides." Why, then, did the Butcher of Baghdad conceal them in camouflaged ammunition dumps? Perhaps he was afraid of losing the element of surprise against the aphids. Now, President Obama has declared that Iran has a "right" to nuclear power. Although some have found this statement shocking, it merely echoed what has been American policy toward North Korea since the Clinton administration. These nations' interests in nuclear energy are dubious to say the least. Iran already has vast reserves of easily accessible oil, and North Korea has deliberately kept its people literally in the dark for years. Of course, Obama does not endorse their ambitions of producing nuclear weapons, but the trouble is that both civilian nuclear power and weapons-grade material can be produced at the same dual-use facilities. This means that the president cannot destroy one of these countries' nuclear plants, the way Israel did to Iraq in 1981, because doing so would be a violation of their "rights." Practically any object can be a "dual-use" item, in that it can be used for either innocent or sinister purposes. The determining factor is context. It matters whether a box cutter is in the pocket of a clerk at the grocery store, or a young Muslim man boarding an airplane. It also matters whether a large supply of nitrogen fertilizer is being stored in a potting shed, or in an apartment full of subversive literature. Likewise, it makes a difference whether dual-use chemicals are being treated as military supplies by a dictator who has used chemical weapons in the past. The meaning of a nuclear plant is different, too, when it is run by evil maniacs who have sworn to wipe Israel off the map, or who threaten to start lobbing missiles at Hawaii. Repeatedly, a large percentage of Americans have chosen to take dual-use items out of context in order to give Saddam Hussein, Kim Jong Il and the Iranian mullahs the benefit of the doubt. That's like assuming that Jason Voorhees had simply gotten lost at a beach house full of co-eds on his way to a hockey game, for which the price of admission was one machete. There comes a point at which such deliberate obtuseness constitutes complicity in the inevitable crimes.